...more than once by some lovely bloggers in the new game that is going around. I was originally tagged by my sweet friend Heather over at Interior Groupie... and I never got around to answering her questions. Then just last week I was tagged by Barbara from hodge:podge - so I knew I had to jump on it and answer her 11 questions (I had to do it eventually, right?). 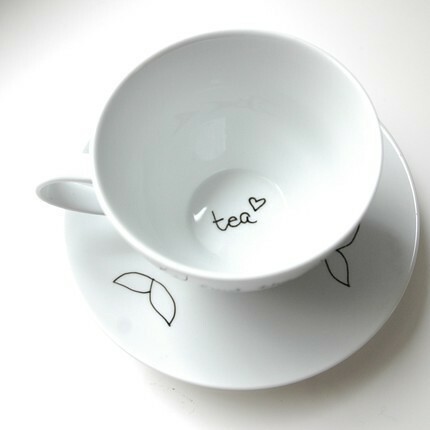 - Though I have recently started to drink coffee, I am more of a tea drinker. 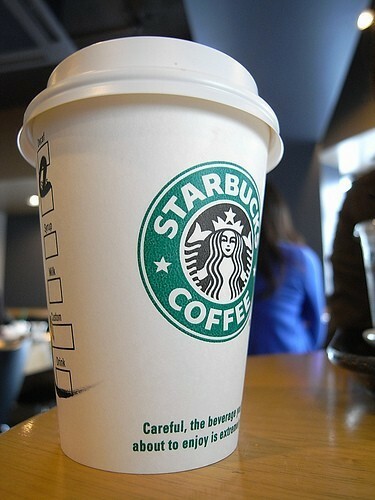 It's a warming and comforting drink to me and I usually have at least 2 a day. One to start my day, and one to help me unwind at the end of it! 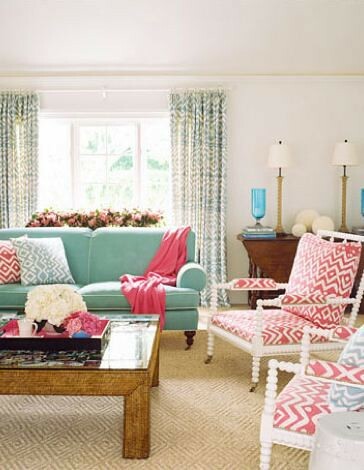 - I'd have to say blue - in any shade... even though recently I've really been loving all kinds of shades of pink. Side effect of having a daughter? - Blogs. Always blogs! There is so much inspiration from the professional world as well as all of the personal and DIY projects that bloggers themselves tackle! 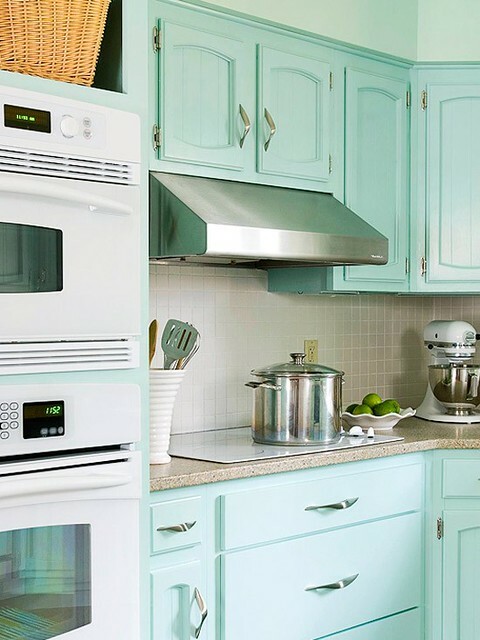 I find inspiration for everything from food, to fashion, decorating, organization... and more. I love all of the fabulous things you can find via the wonderful world of blogging. I'm sure most of us feel the same, no? - Of the one's I have my favourite would have to be the Tricia Guild book my cousin bought for me for Christmas 2010 - A Certain Style. There is a ton of beautiful eye candy and so much inspiration in it. Definitely one I wish I had more time to devour again and again. - This is such a hard question for me to answer. I still feel like I don't really know what I want to do with my life. I know I want it to be creative, and flexible... but that's not saying much, is it? - First thing I would do would be to pack our bags and head out on a little family vacation... just the three of us, until the excitement of us winning passed. Then the proper investments would be made and our parents would all be debt free. 1. 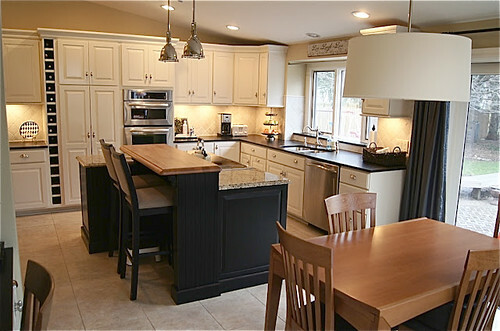 If you had an unlimited budget, what room in your home would you renovate/redecorate? 2. It's Friday night, you have the house to yourself - what do you do? 3. If you could go on a shopping spree in any store, which one would it be? 5. What's your favourite book that you've read in the past year? 7. What do you collect, or would like to/wish you could collect? 8. What one item could you not live without? - The other week she started just sticking her tongue out at us, and she thinks it's the best thing ever. She finds it hilarious when we stick our tongue back out at her... and boy does her smile melt my heart. - She used to hate rolling onto her belly... but it's suddenly become her favourite thing to do. She barrell rolls all over the place these days. 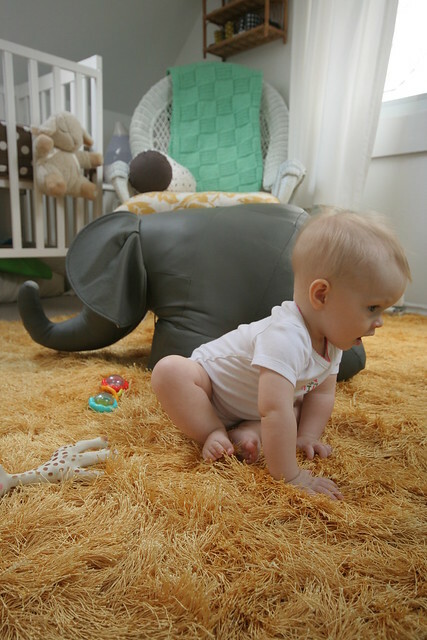 I already feel like I have a hard time keeping an eye on her... just wait till she starts crawling, huh? - Speaking of crawling, little girl is working on getting from sitting to her belly, and trying to push herself forward with her feet. This is usually done to grab a toy that she has tossed out of reach... or to try and get her tiny hands on my cell phone or kobo. She's a tech junkie already people! Two weeks ago (while I wasn't blogging), B and I made some alterations to our to-do list. Primarily, we changed around our priorities and added some things. I'll share more on the why and what in the coming weeks, but for now I'll just share what we've been getting up to. You may remember that it looked like this the other week after I started cleaning it. Of course, cleaning was just the first step in preparing it for a facelift. B and I had agreed it needed to be painted, so last week we pulled out my Para Paints paint deck and started to browse through the different shades of grey. We finally landed on "Gale Force Winds". The next day I headed over to our local Home Depot, with the gift card they provided to me after completing my chalk board project back in the fall. 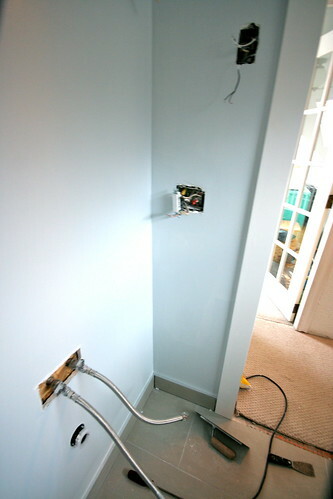 I colour matched our Para Paint to Behr's paint and primer in one, and that night I got to painting. 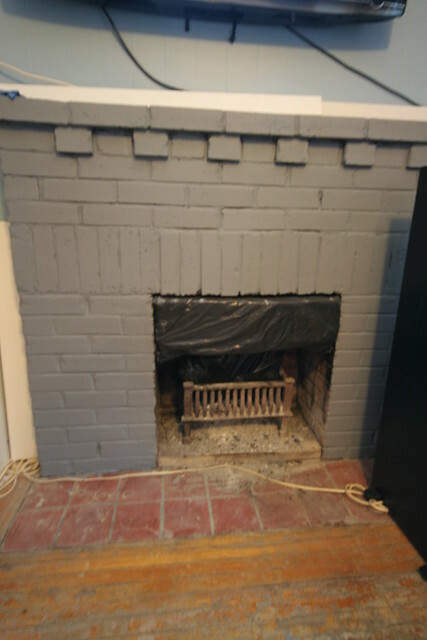 Of course, instead of the TV over our fireplace, we plan to expose the rest of the brick and paint it the same grey as the lower portion. 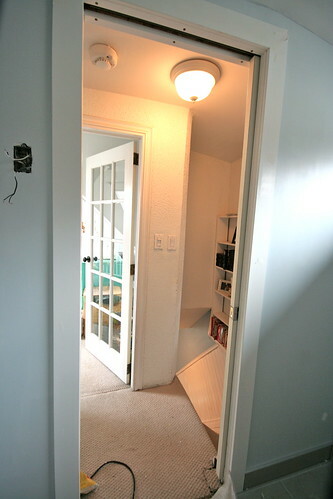 I'm so thrilled for this part of the "refresh", I know it will make a huge impact in the room. Now we just need my father to be freed up from all of his other projects. Do you have any big new projects coming up? Maybe anything custom being added to your house? 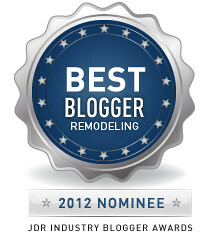 I also want to let you all know that First Time Fancy has been nominated as Best Remodeling Blogger in the 2012 JDR Industry Blogger Awards! Voting is now open. Please vote for us here. The badge to the right also links to the site where you can vote for us! Voting is open until April 13th, and we'd love your support! Fancy Friday Love - with some extra Love! Is it actually the last Friday of February already? Time sure does fly when you're having fun! 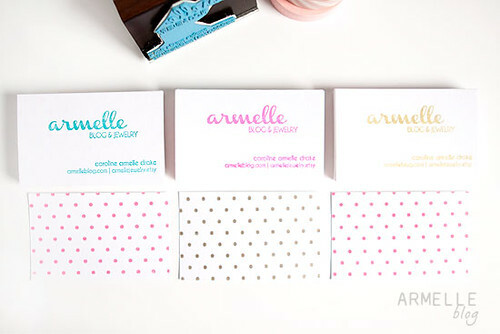 Between launching my Stella & Dot business, and sprucing up this little ol' blog, February was such an exciting month! The excitement isn't over yet though. Before I get to that, let's see what I loved this past week, shall we? 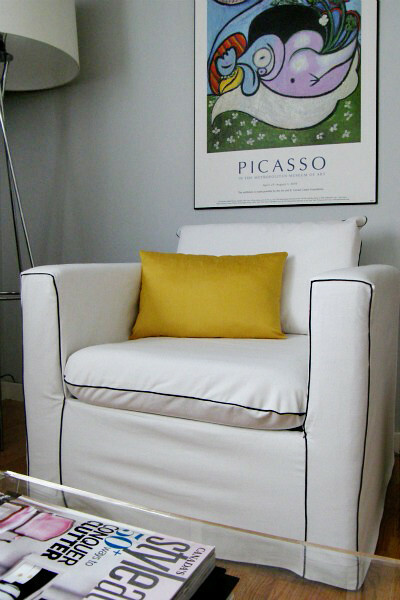 Did you see the beautiful slipcover Ameila made? Girl's got talent, hasn't she? Yesterday on Oh So Beautiful Paper, I fell in love with these prints from The Wheatfield. 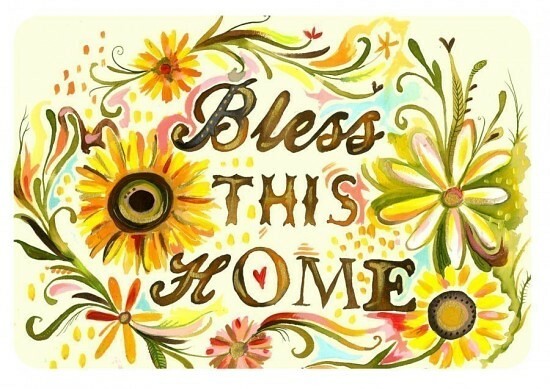 In particular, I would love to hang the one below in our front entry. Sweet, and totally in with the watercolour trend! Well, we have a very special weekend ahead. The love of my life celebrates his birthday tomorrow... his big 3-0 to be exact! I have some very special things planned to show him how special he is to both me and little Halle... and boy does he deserve it! I'll be back next week (I PROMISE!) with more details on how we celebrated. I'll also have some projects to share. I may have been silent on here, but we've been busy on the home front! What fun things do you have planned for this weekend? I know that this week was meant to be my first week back to posting full time... and I fully intended on it being that way. Unfortunately, on Saturday evening, my lovely little MacBook met it's early demise via a glass of water. I'm still a little torn up inside about it. Currently we are using a gifted desktop computer from a good friend who is doing his part to try and save my poor little MacBook. With that said, I'm shifting my regular posting to begin again starting next week... I Promise! In the meantime, I'm gonna send you over to Style at Home, where one of my little art project has been posted up alongside 10 other fabulous bloggers! 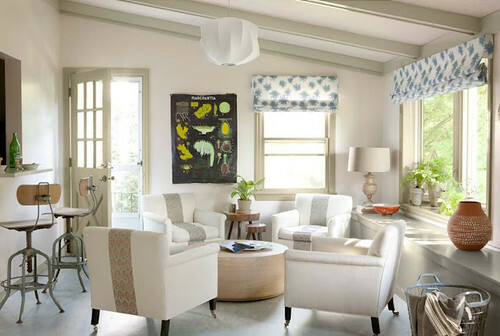 If you're looking for a way to add some art to your home without breaking the bank, be sure to check out all of these great ideas. A big thanks to Style at Home for including me in this great little round-up! 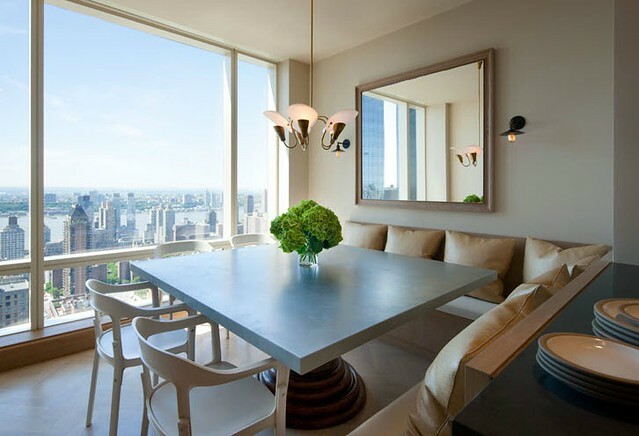 This apartment, owned by interior designer Frances Herrera, is so beautiful. I loved every room - but would be thrilled with an office as beautiful as this one. Check out more photos over on desire to inspire's post from last Friday. Weekend time again, and this time it's a long weekend! Joy! Tomorrow I have a trunk show booked with a girlfriend, and then some girl time planned. Sunday Halle and I have a tea date with an old friend and Monday, we hope to squeeze in some fun family time around the city. Throughout all of this, hopefully we can get back on track with all of the projects we need to complete around the house. Overall, I'm so looking forward to this weekend. What do you have planned? Yes! I finally bit the bullet and the blog has been redesigned by Lindsey of Designer Blogs! I love it. She did a great job capturing what I had in mind for my little ol' blog. Simple, but pretty - and the colours are perfect. There will be some changes to the side columns soon, I just need some more time to think it out and play with it some more, but so far I'd say we're looking a little better than before. I also love that you can now easily find me on facebook, twitter and pinterest - nice right? So, I'd say that since the beginning of the year we've been moving along quite quickly in crossing items off of our to-do list. We were both motoring along and feeling really good about everything. Well last week something happened that distracted us a little and we seem to have derailed, with things coming to a halt around here. Everything is good - if not really good - and this week we should be back to crossing some things off of our list. See you already forgot everything I just wrote, right? Last Friday, Amelia did a great round up of some awesome finds from Chapters/Indigo. 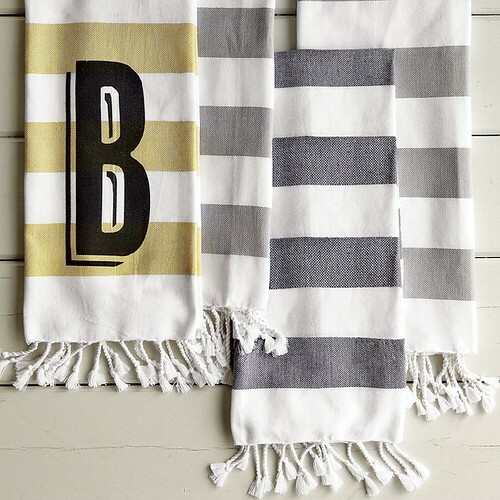 I immediately added these guest towels to my must-have list for our new bathroom! Aren't they perfect? 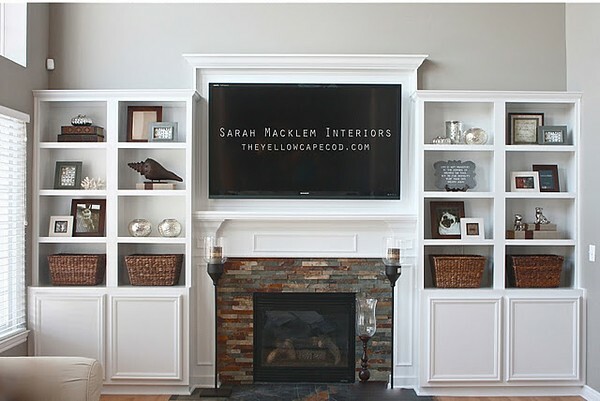 Last Friday, Jennifer of Rambling Renovators kicked off her new BlogTalk Series. I think this is going to be such a fabulous place for not only those who are new to blogging, but those of us who have been kicking around for a while! So much great discussion on her first point about Networking. Check it out, and be sure to add to the conversation! As Jen points out, we'll all learn so much from one another! 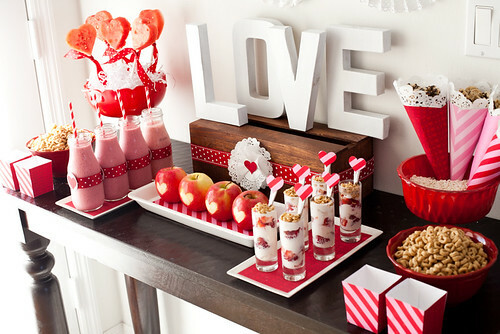 Here's a great idea for a heart healthy Valentine's dessert table, from Project Nursery! All these tasty ideas are so smart and easy... and healtheir options for treats! How can you not love this? I'm so looking forward to this weekend! Tomorrow I have a lovely breakfast date with a good friend, and Sunday is my Stella & Dot launch party! I'm so excited to see what everyone has to say about the gorgeous spring line. Should be a great weekend! What do you have planned? 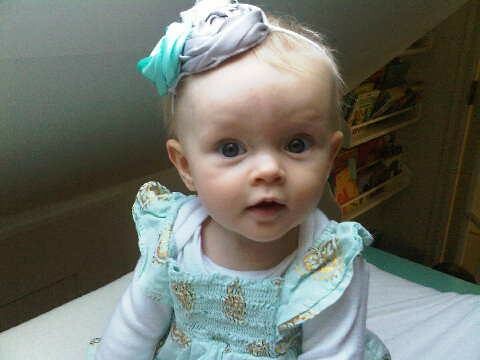 Yesterday Halle and I packed up and headed to Liberty Village to meet up with Brittany and pay a visit to westelm. It was so great to get a chance to finally meet Brittany, and we had a lot of fun. We started off at Starbucks, grabbing something to drink and chatting a bit... while Halle greeted everyone who walked in with a squeal and the odd wave. 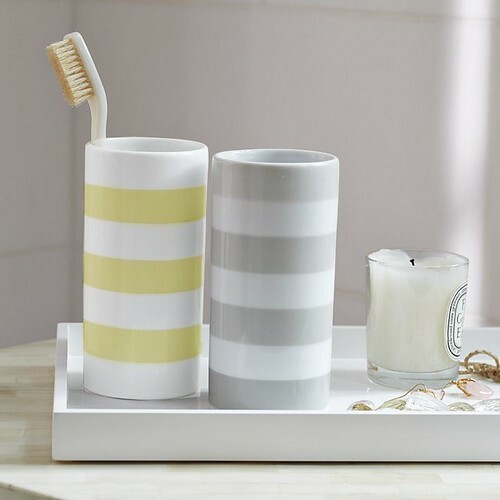 The Gallery Stripe Shower Curtain in Citron is perfect! Even B likes it, and Brittany and I agreed it would be a nice way to help the bathroom colour scheme flow with some of the other rooms in our home. I'm definitely glad that I saw it in person before I saw it online though - the pictures do not do this curtain justice at all. 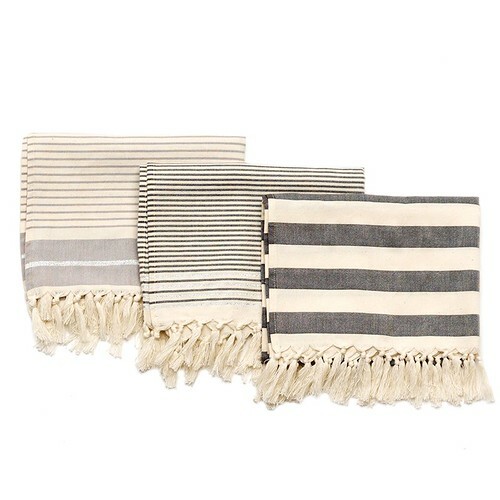 The Hammam Stripe Hand towels are divine. 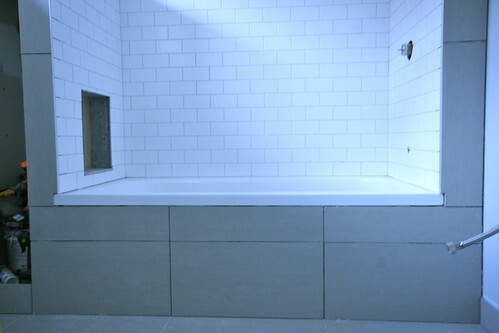 The quality is great and I would love to add some in citron and plaster to our bathroom. These aren't an immediate need though... so we can wait a bit before we jump on the hand towel wagon. I'd take a Modern Stripe Tumbler in either colour... or maybe one of each! I'll take the yellow and B can have gray (sadly the yellow is on backorder at the moment). 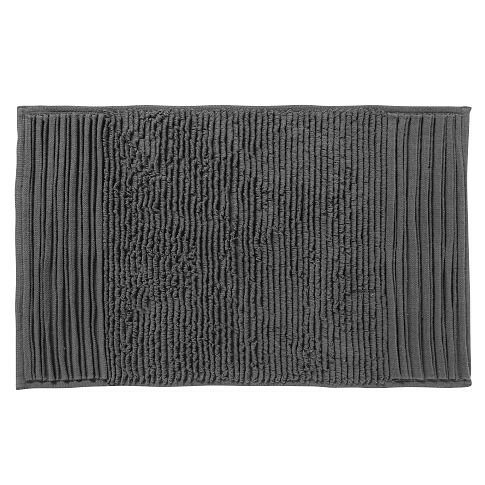 To break up all of the stripes, I'd choose the Pleated Stripe Bath Mat in Slate. I also love the texture of it, and the dark colour. B and I both agree we are not a fan of white bath mats anymore, so this would be perfect for us! 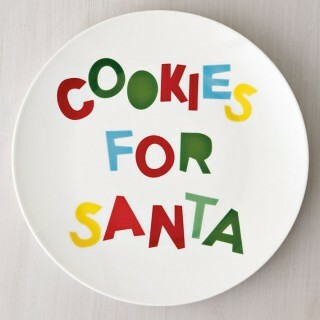 It was on sale for $0.97 - the perfect piece to add for future Christmas traditions with her! I love it, and the price made it a no brainer. Have you been on any fun shopping outtings recently? Maybe you've picked up a new piece for your home that you're excited about? I always love hearing about people's favourite shopping spots and good finds! 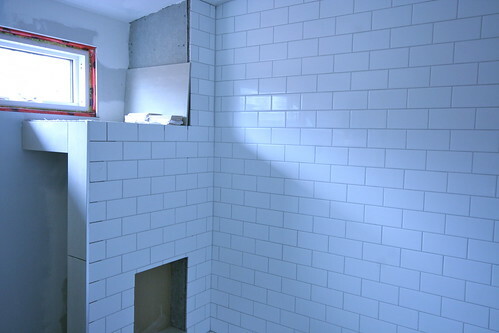 Our finished bathroom is in sight! Since last week B absolutely motored his way through the bathroom, in order for it to be functional for our SuperBowl party this past Sunday. 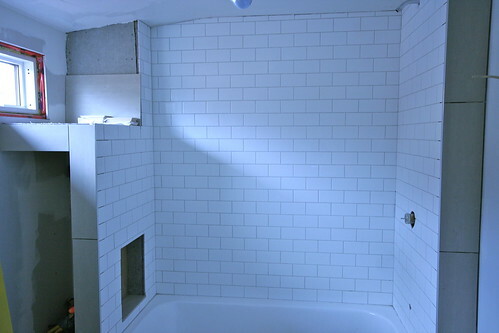 When I posted last week, B and my Dad had finished most of the tiling and installed the pocket door. 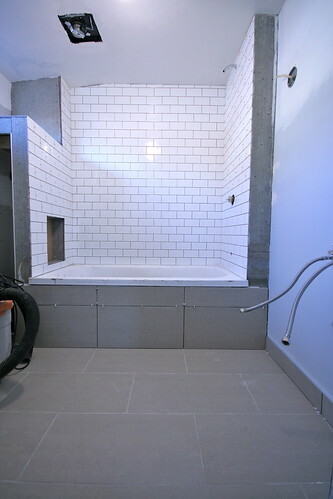 It's hard to tell in these photos, but we used the same warm grey for the subway tiles, as we used on the floors. 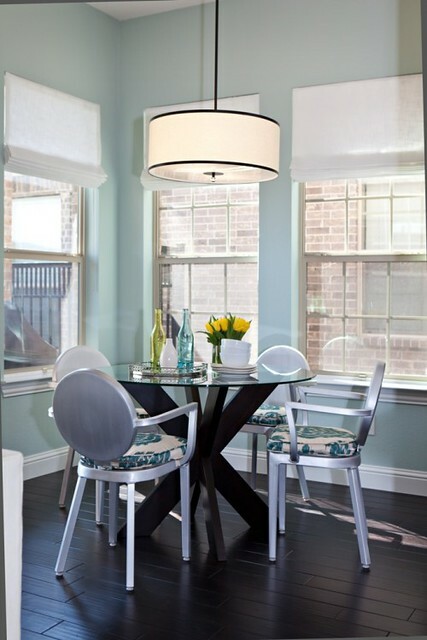 It's the perfect amount of contrast for the look of the room. All white would've been too stark for my liking, and anything darker just wouldn't have fit. Saturday morning when my father arrived they got to work trimming out the pocket door, and finishing the ceiling and the last of the tiling. I wasn't around to get many photos, as Halle was left fussy after getting a shot on Friday. 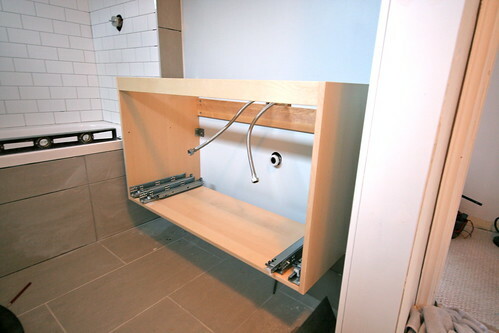 I did however get a chance to photograph the biggest job they did all day - the prep and installation of our Godmorgon vanity. 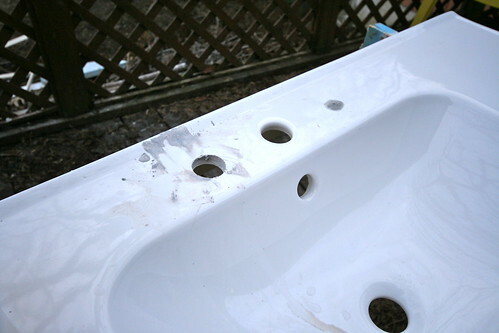 The first and most important thing to do was to get our ODENSVIK sink ready for our Delta Victorian Two Handle Widespread Faucet. 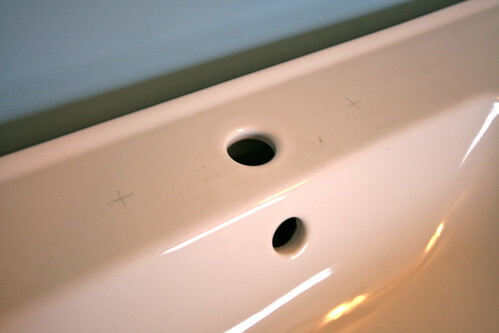 They started out by measuring and marking the sink for our handles to make sure it was 8" center to center spacing. Then outside the sink went. 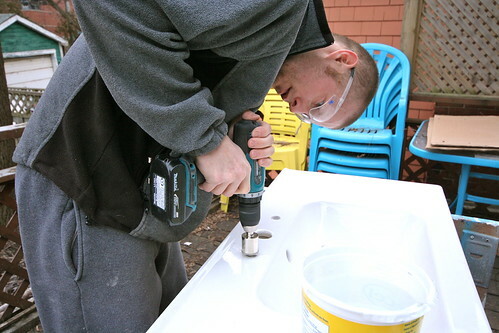 B started by using his drill to begin the holes for the handles. This part made me extremely nervous as I could see the drill bit bending, and B didn't throw on safety glasses until he moved onto the bigger drill bit. Thankfully he still has both eyes. 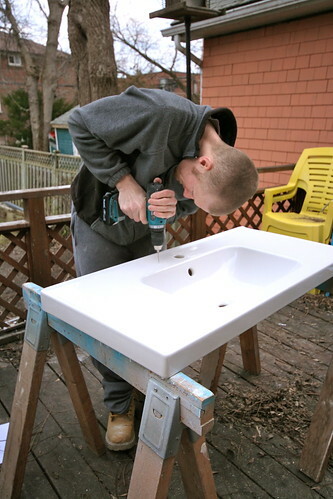 The important part while doing this, was to keep the sink and the bit wet. It helped keep the drill bit cool and clear of dust for a cleaner cut. 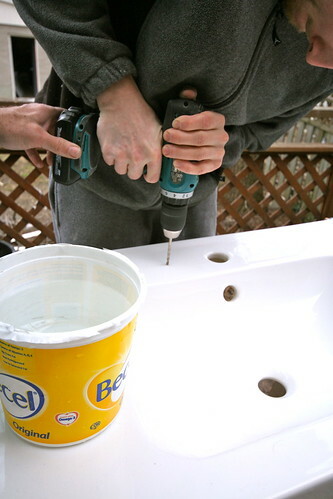 Thankfully, they were successful and we ended up with perfectly cut circles to install the faucet handles. 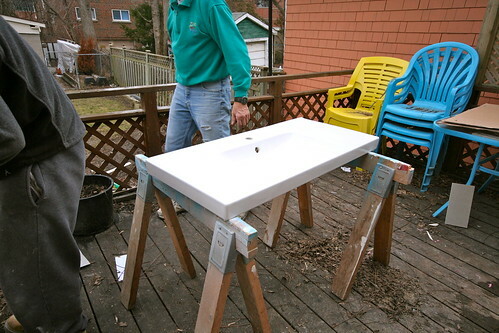 Then came the exciting bit - finally getting the vanity into place and working! It fits perfectly into the space, with a couple inches on either side of it - perfect for sliding the shower curtain behind. So, I guess now you will just have to wait! Yesterday was the big game! An especially big game for our household. Four years ago, B and I watched the SuperBowl together for the first time - Brady vs. Manning. 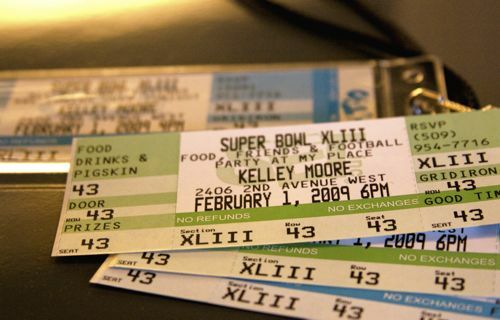 Yesterday, Halle saw her very first SuperBowl with us - the rematch of Brady vs. Manning. Of course, those smiles were relatively short lived (except Halle... she had a great time playing with all of our guests). I planned on sharing some fun details of the game, but Halle was all stranger danger, and only wanted me to hold her (No B or her grandparents either), so there are no other photos. After posting about cleaning the fireplace the other day, I started to think about other easy projects I hadn't gotten around to yet. This morning was time to tackle one of those things. Back in October (yes... OCTOBER), I purchased the domain firsttimefancy.com. This morning, I finally got my blog set up so I'm officially at firsttimefancy.com. No more "-" and no more blogspot in there! The blogspot.com domain will still send you over to my blog... but I wanted something a little more "official", if you will. This is only the first of many changes that will occur around here over the next little while, and I am so excited about that! 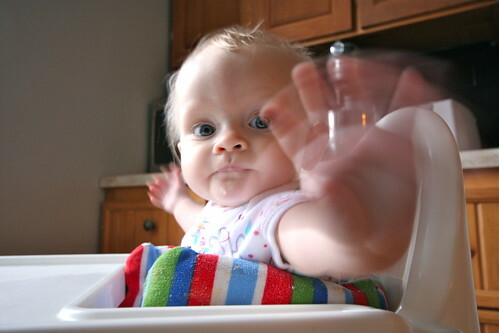 **Update: When changing my domain, I apparently lost all of my blog rolls! Fun times! I will do my best to repopulate, but if I am missing you and you would like to be added, please leave a comment with your blog address and which blog roll you would like to be added to! Thanks friends! 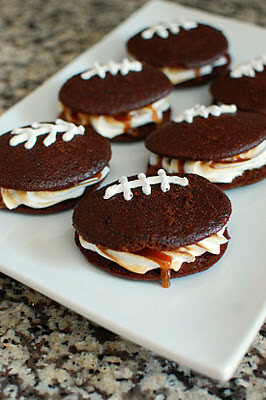 Since we're hosting a Superbowl Party here on Sunday, we've been trying to pull together a yummy menu. I doubt I'll have time to make these Ultimate Whoopie Pies from Beantown Baker - but rest assured they are on my dream menu for this event! Chocolate cake with toasted marshmallow and salted caramel sauce!? YUM! I'm so looking forward to this weekend! With plans to wrap up this renovation (decorative touches not included), we'll also be hosting our annual Superbowl Party! 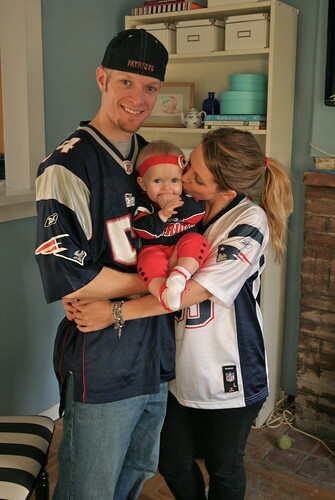 We're even more excited to see our Patriots play - you can bet all three of us will be decked out in our Patriots gear! Watch for pictures on Monday. So there will be lots of yummy food consumed and lots of great family and friends to hang out with - we're so excited! What are your plans for this weekend? 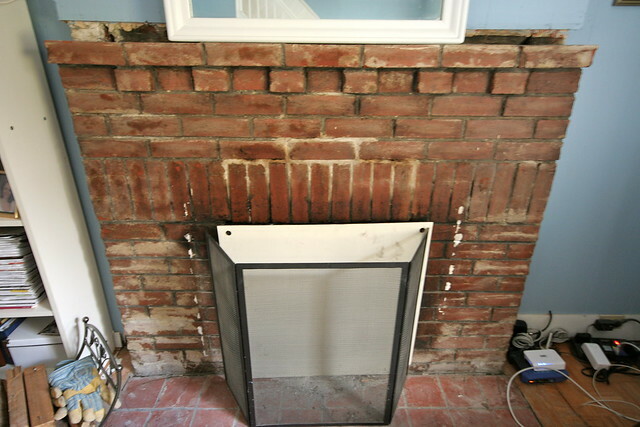 Or brick fireplace... personally, I was more looking for the latter. 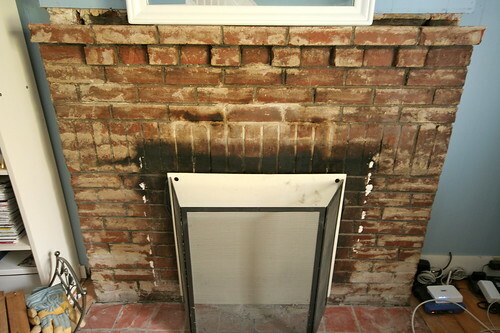 The other day while playing with Halle, I decided I'd finally had enough of looking at our soot stained, dirty brick fireplace. Cleaning the brick was honestly one of those things that was so easy, I'm actually embarrassed by how long it took me to get around to doing it. Can you say lazy much? Okay... maybe just preoccupied, but either way this little project should definitely have made it's way to the top of my list! Geeez. After seeing it cleaned up (at least a little), there is no doubt in my mind that we will paint it... and hopefully sooner than I had originally thought. Do you have any simple projects you've been putting off, and need to finally cross off of your list? Put it out there, maybe you'll find that motivation that you need to get it done! Good Morning, I'm moving away from my usual post today to share some exciting news with you (and also to give us a bit more time to work on that bathroom of ours). Some of you found out at the Design Bloggers Meetup on Saturday, but for those of you who didn't, here's the news! At the end of last month I made a little decision, that I hope can help me achieve one of my personal goals for this year. About a week and a half ago, I signed up to become a Stella & Dot stylist. It was thanks to Sarah, that I originally became interested in signing up, and even though she no longer sells, she hooked me up with a great sponsor and I am thrilled to be part of the Stella & Dot team! 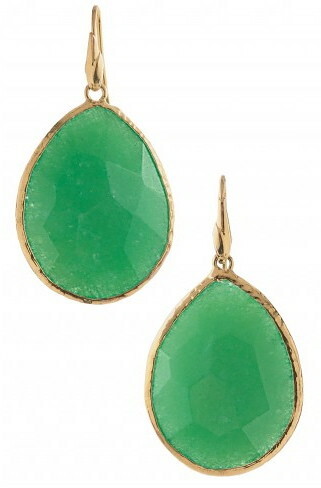 The Serenity Stone Drop earrings are definitely my favourite from the Amalfi Collection - if not the entire Spring Collection. 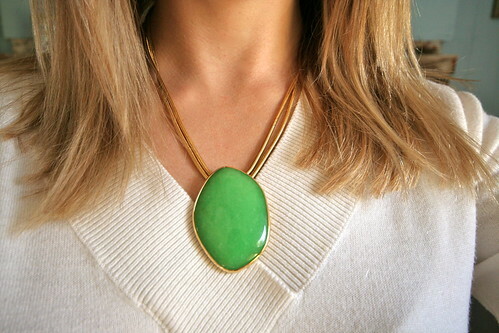 I love the bold, rich colour... and the $54 price tag isn't too shabby either! 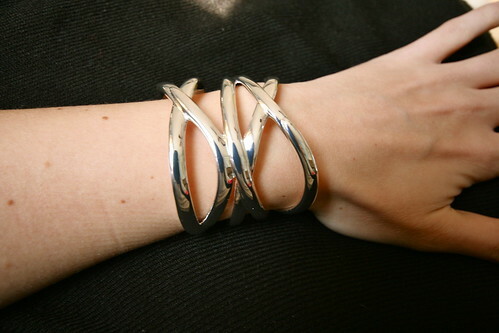 The Odette Cuff is another piece that, though it's stunning online... it's jaw dropping in person! Two pieces that I cannot wait to add to my samples are the Campari Necklace and the Pegasus Necklace. Aren't they incredible? 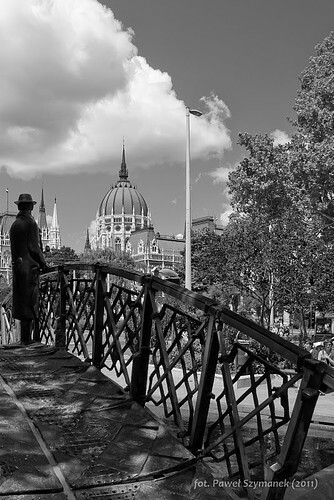 You can find my personal website right here (and now also in my right hand side bar). Feel free to shop around, or contact me if you have any questions, or are interested in booking a trunk show or becoming a stylist yourself! I'm hosting my own launch on Sunday February 12th from 2:00pm - 4:00pm, in Whitby. If you would like to attend, shoot me an email and I can send along more information.